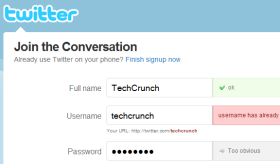 If you’re on Twitter, that means you registered an account with a password that isn’t terribly easy to guess. As you may know, Twitter prevents people from doing just that by indicating that certain passwords such as ‘password’ (cough cough) and ‘123456’ are too obvious to be picked. What would be interesting to know is if Twitter got this list from somewhere else, or if they actually analyze which passwords were most commonly chosen by its tens of millions of users in the past, rendering them ‘too obvious’. If the latter, that means this list is probably representative of most Web services.